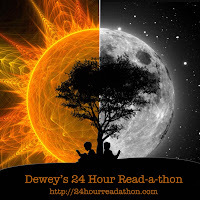 The Relentless Reader: The Read-a-Thon is Coming! The Read-a-Thon is Coming! The Read-a-Thon is Coming! The Read-a-Thon is Coming! Woot! Can you tell I'm looking forward to this event? I wrote a post for the fine folks at the Read-a-Thon site outlining some tips to make your day of reading a success. You might find it useful, check it out! Are you participating? (It's not too late to sign up!!) Hope to see you around on Saturday! Yes, I do believe I get the sense that you're excited. ;) I'm not signing up because I spent last weekend in bed, reading and sleeping. I don't think the huz will let me get away with that two weeks in a row, but I'll be with you in spirit. I signed up and I'm a little nervous but I think I can do this! You can do it, you can! Last time I think I made it 22 hours. I was like a zombie by the end, lol. Fuzzy headed and EXHAUSTED. But it was fab! I'm participating! I am behind because the last two weeks have been insane with work and I NEED these read-a-thons! This time I'm not participating because it somehow scares me a little, but perhaps next time. There are a lot of people and I'm sure you will have a lot of fun! I hope you'll change your mind Isi ;) If not I'll be bugging you in October, lol. That's when the next read-a-thon will be! Mark you calendar, ha ha. OK, so in October we will see. That's completely understandable! Honestly though, you don't have to talk to anyone, lol. You just read your little heart out all day and write a wrap-up post at the end if you'd like. Is this peer pressure working? ;) Ok, ok, I'll be quiet now! You're a busy bee :) You're the 2nd person I've heard say that Sunday would work better. I wonder if that would be possible for next time? Looking forward to it, though unfortunately I'll be doing my usual and joining in some of the day only (similar reason to bookfool, grrr other halves). Your book count is surely to be off the charts after this weekend! Grrr, lol. I hope to see you around the blogosphere that day Charlie! I've never participated and I would have this year, but family came in to town at the last minute and I can't ignore them. So, I think I'll have to wait until next year to join in all that reading fun ;) Happy reading to you!! Ah yes, it wouldn't be nice to ignore your family members ;) Make them read with you?? Ha ha! I won't be participating but hope you have a great time! Thanks :) As you can see, I'm very much looking forward to it! I've never participated before, and I actually can't really participate this time either since my sister is visiting! But I'm going to stop by to check in on some of the stuff going on, and participate a little bit! Darn family ;) My sis asked me to do something tomorrow. When I told her I couldn't because I have reading plans she thought I sounded a little too happy in turning her down, lol. *yay* Have fun. I am participating too, I do each year :O) Off to see your post. Yay indeed! I hope to see you around tomorrow Naida! Squee! It's going to be awesome! Love this! Hilarious! See you manana! Hurray, almost readathon time! I love this post, so funny. I'll be participating too, although my family comes first (our holiday fell through - if it hadn't I wouldn't even be around for the readathon). So, I hope to have fun with my family as well as reading too much).